Championship Team Portsmouth West High School. Pictured Left to Right: Legal Advisor, Jay S. Willis, Whitney Campbell, Dalton Pertuset, Evan Green, Eli Cole, Candice Orris, Noah Lovins, Anna Lovins, Coach Jennifer Moorhead, and Jordan Willis. 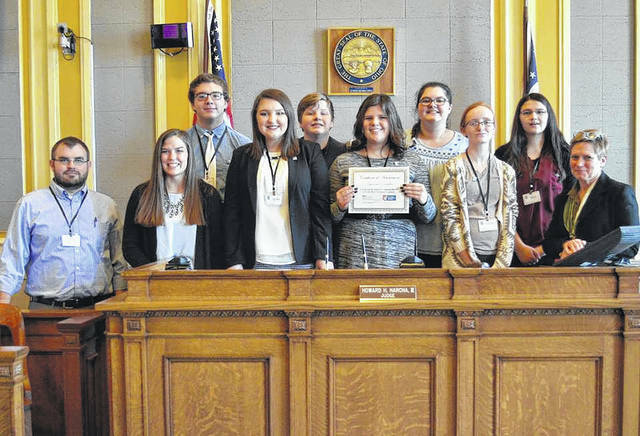 The team from Portsmouth West High School emerged as champions during the Scioto County District Mock Trial Competition on Jan. 26. They will now advance to the regional competition on Feb. 16, joined by the runner-up team from Portsmouth High School and advancing team from South Webster High School. Regional winners will compete in the state competition on March 8-10 in Columbus. 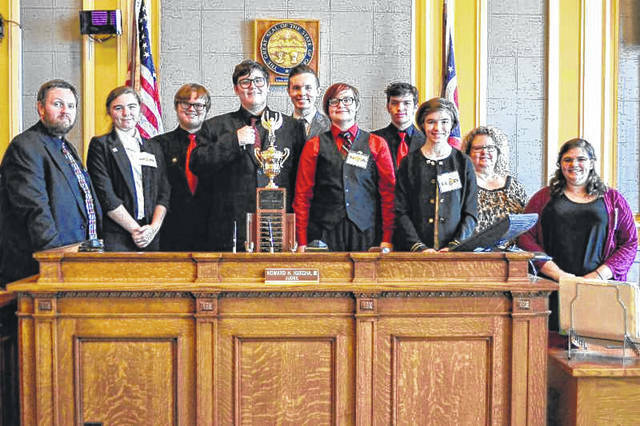 The 2018 State Champion team will represent Ohio at the National High School Mock Trial Championship in Reno, Nevada, May 10-13. More than 3,000 high school students across the state participated in the Ohio Center for Law-Related Education’s (OCLRE) 35th Annual Ohio Mock Trial Competition. The Scioto County District Competition is coordinated by the South Central Ohio Educational Service Center’s Gifted Coordinator, Sharee Price, along with Judge Howard H. Harcha, III. The District Competition included 12 teams from eight schools — including Ironton, St. Joseph, Notre Dame, Portsmouth, Portsmouth West, River Valley Bidwell, South Webster, Valley and Wheelersburg. The champion Portsmouth West High School team included Legal Advisor Jay S. Willis, Whitney Campbell, Dalton Pertuset, Evan Green, Eli Cole, Candice Orris, Noah Lovins, Anna Lovins, Coach Jennifer Moorhead, and Jordan Willis. The runner-up Portsmouth High School team included Legal Advisor Bill Shaw, Alyson Ferrara, Jaiden Rickett, Sara Born, Megan Conley, Kathryn Davis, Allison Douthat, Emma Coleman, Sam Finn, Coach Bruce Kalb, Aiden Kammler, Collin Finn, Micah Simmons, Anne Marie Raies, and John Nelson. The advancing team from South Webster High School included Legal Advisor Robert Johnson, Bobbi Johnson, Haley Williams, Caitlyn McNeal, Audrey Litteral, Skyler Holbrook, Leighvi Houston, Emily Sessor, and Briana Collins. Outstanding Attorneys awards were given out to Grace Raison, Bobbi Johnson, Sara Born, Anne Marie Raies, Alex Holtzapfel, Ashley Smith, Landon McBee, Eli Cole, Noah Lovins, Josie Jones, and Karsyn Conaway. Outstanding Witnesses awards were given out to Jordan Willis, Haley Williams, Alyssa Sheets, Rachel Horner, Allison Douthat, Trevon Donini, Elizabeth Cassidy, Brooklyn Price, Grace Raison, Baylee Martin, Kelsie Stewart, and Molly Thompson.